Our first AACPS Speaks! event: Building Hope & Compassion in Public Spaces, was held on February 24 at Maryland Hall for the Creative Arts. AACPS Employees and their guests from the community gathered together to relax, network, and learn about the power of art and public space to bring our community together. Take a look at the photo gallery from the evening and click here see the night's comple program. On February 24, guests watched artist Candy Chang's TED Talk: Before I Die I Want To... and were joined by keynote speaker Rob Levit, critically acclaimed musician, artist, author, and creativity expert & consultant. Guests also had the opportunity to participate in a Q&A session with a panel of educators and artists from the Anne Arundel County community. We are already looking forward to our next event! Information will be posted so check back later this year for more details! 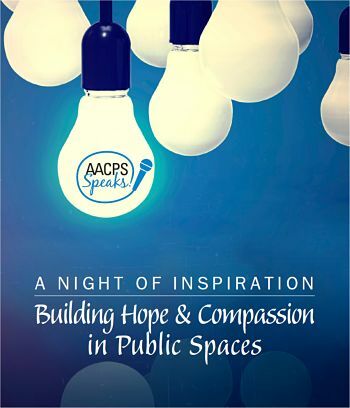 Do you have an idea for a future AACPS Speaks event or want to get involved in helping us plan an event? Contact us at aacpsSpeaks@aacps.org. AACPS Speaks is a new and exciting speaker series for Anne Arundel County Public School employees and the community. Each event offers participants a chance to relax, network, and “fill their tanks.” Participants will walk away with creative ideas, solutions to problems, access to resources, and increased hope for humanity.